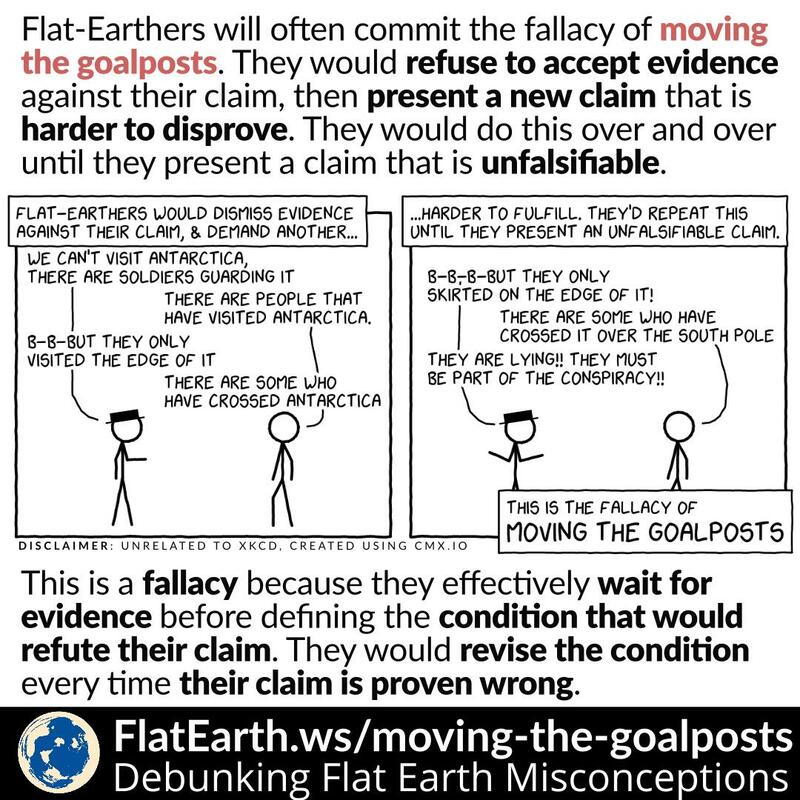 Flat-Earthers often commit the fallacy of moving the goalposts. When their claim has been proven wrong, they would revise their claim and demand another evidence that is harder to fulfil. They would do this repeatedly until they present an unfalsifiable claim, a claim that is impossible to prove. 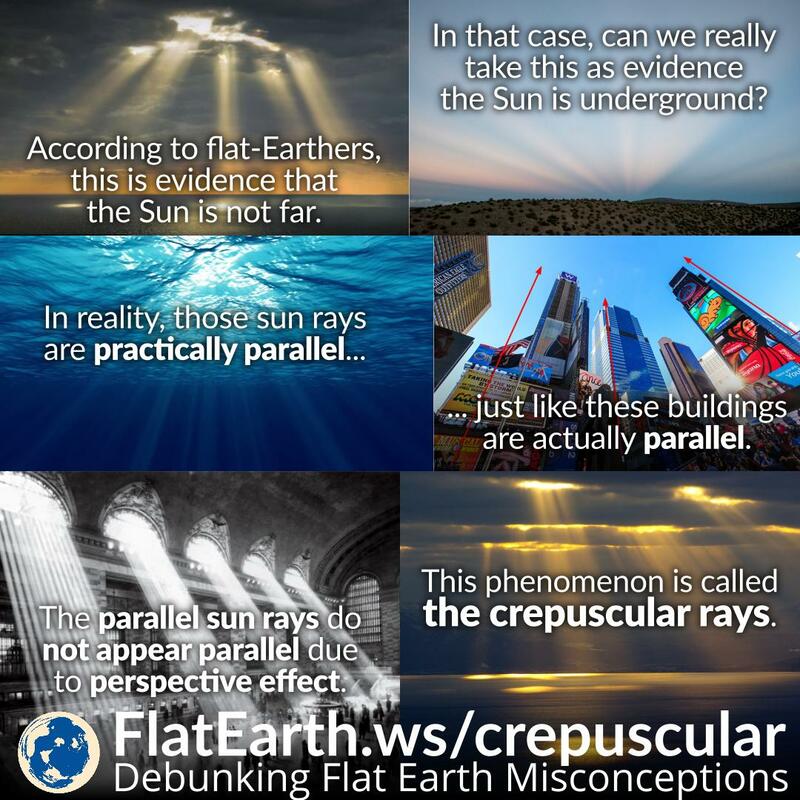 Some flat-Earthers consider crepuscular rays as evidence that the Sun is not far. In their mind, the Sun is only about ±5000 km circling above us. In reality, the actual distance of the Sun is ±150 million km. Some flat-Earthers —presumably never seen a total lunar eclipse in person before— actually claim that. The Moon turns red during a total lunar eclipse. But if the Moon is completely in Earth’s shadow, then how does it turn red? The atmosphere of the Earth acts like a giant lens and refracts some of the sunlight into the surface of the Moon. Apparently it is a very common misconception that the phases of the Moon is caused by the Earth’s shadow. Not only among flat-Earthers, but the general public as well. The difference is that flat-Earthers will usually jump to conclusion, and have some outlandish interpretation about this. In reality, the phases of the Moon happen because we see a different sunlit part of the Moon at different time. Not because it is over the shadow of the Earth. Practically every illustration showing the Sun, Earth, and Moon is drawn not to scale. The reason is that the sizes of celestial bodies are far too small compared to the distances between them. Flat-Earthers sometimes use this fact to point out the alleged “failure of modern science” to describe celestial bodies, or even “a mean to deceive us all.” However, the real reason is just that it is practically impossible to create a model of the solar system in the actual scale, using static images, that still effectively describes the objects it is trying to explain. There are many non-stop long-haul flight routes between two locations in the southern hemisphere, all without crossing the northern hemisphere. These routes can only exist if Earth is a sphere. Some flat-Earthers claim there is no non-stop long-haul flights between two locations in the southern hemisphere. Flights need to make a stop in a location in the northern hemisphere because the distance will be too far and such flight will traverse the northern hemisphere, or more accurately, the center of the Earth according to their model. They are wrong. There are many such flight routes. Some flat-Earthers claim that if the surface of the Earth is curved, then a building far away from us should look slanted away from us. But we never actually see this, so they conclude the Earth is flat. 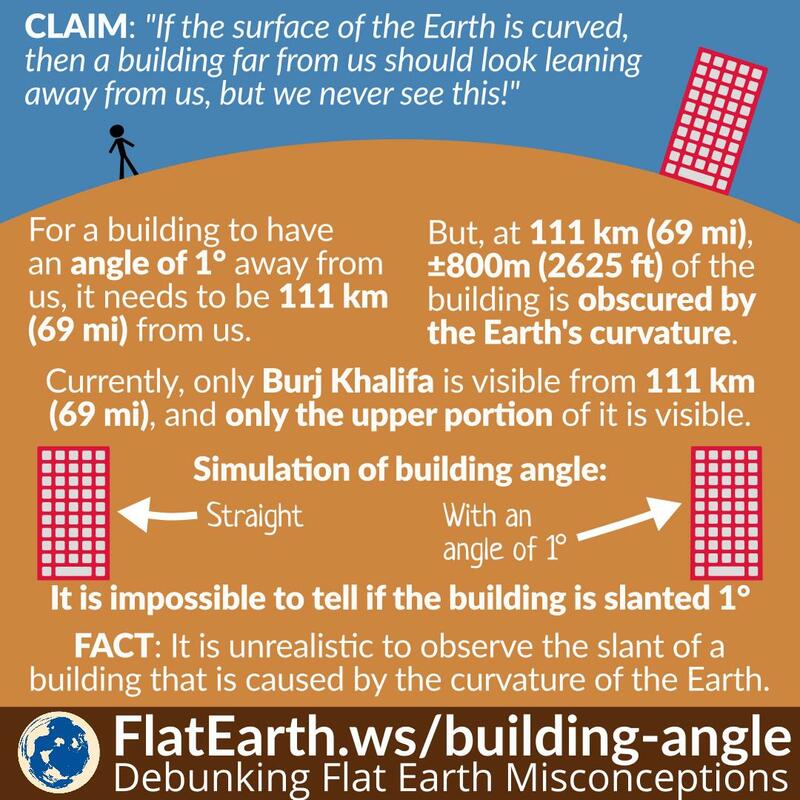 Their deduction is somewhat correct, but let’s see if it is realistic to observe the slant of a building that is caused by the curvature of the Earth. In the northern hemisphere, if we look at the sky to the north, we can observe stars rotate counter-clockwise around a point. This axis of rotation is not visible from observers in the southern hemisphere. On the other hand, in the southern hemisphere, if we look at the sky to the south, we can observe stars rotate in the opposite direction. 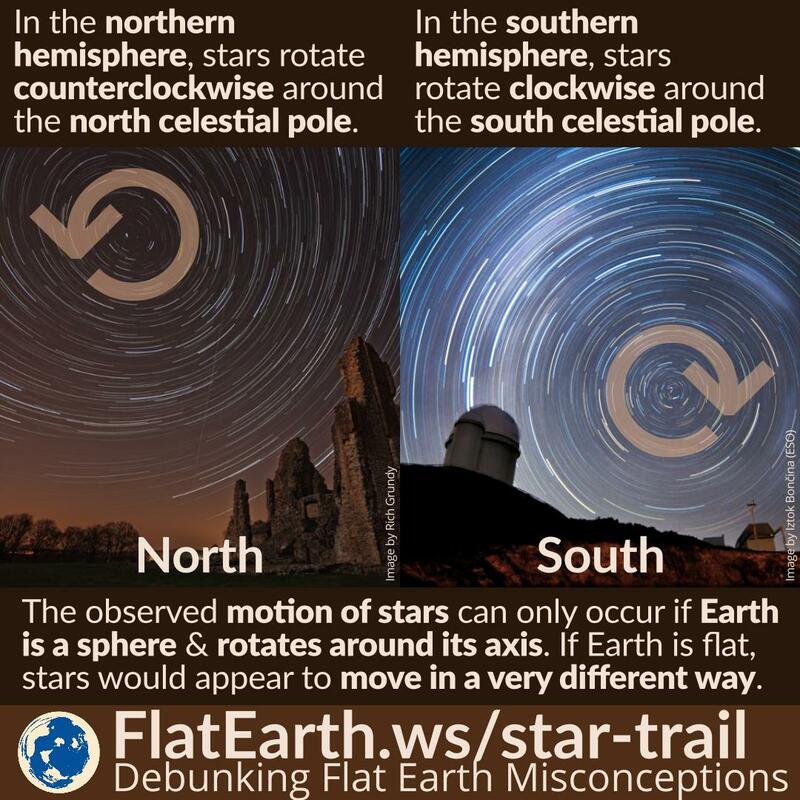 Conversely, this axis of rotation is not visible from observers in the northern hemisphere. This motion of the stars cannot possibly happen in a flat-Earth. The motion of the stars is a proof that the Earth is round and rotates around its axis. 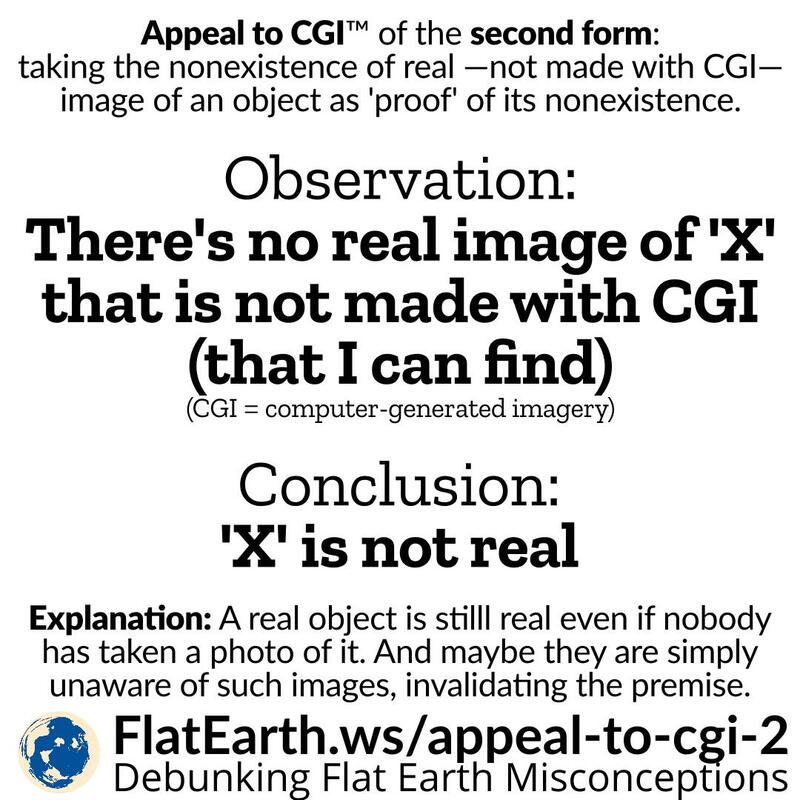 Observation: there’s no photo or video of the object ‘X’ that is not made with CGI. A real object is still real even if nobody has taken a photo of it. The premise itself might be invalid because there could be someone who has a photo of the object, and the perpetrator of the fallacy is simply unaware of its existence. 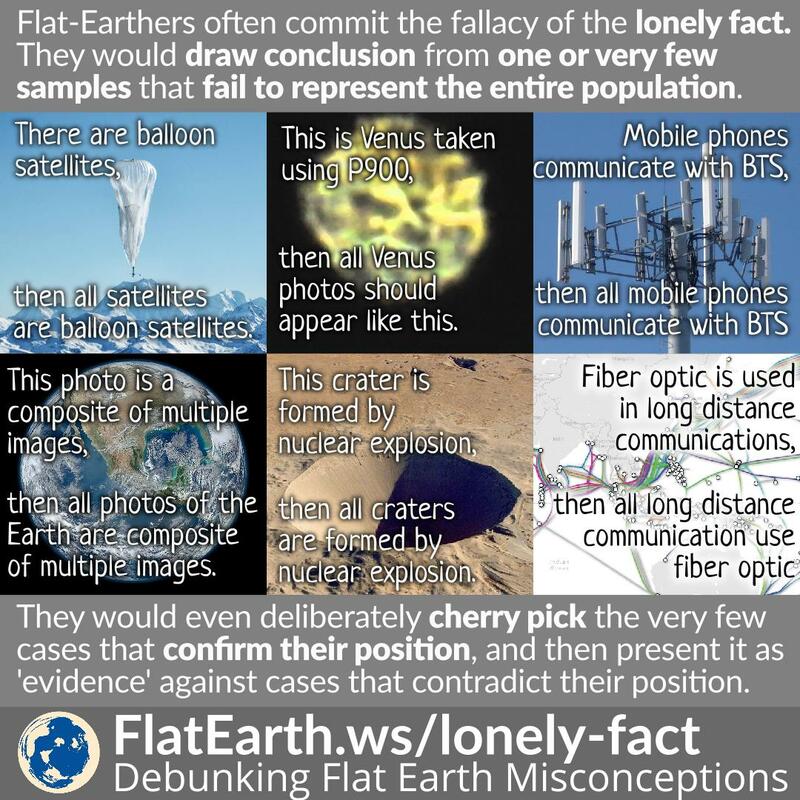 A logical fallacy commonly committed by the victims of the flat-Earth ideology is CGI related. CGI —or computer graphics imagery— is the use of computers to produce realistic images or videos. 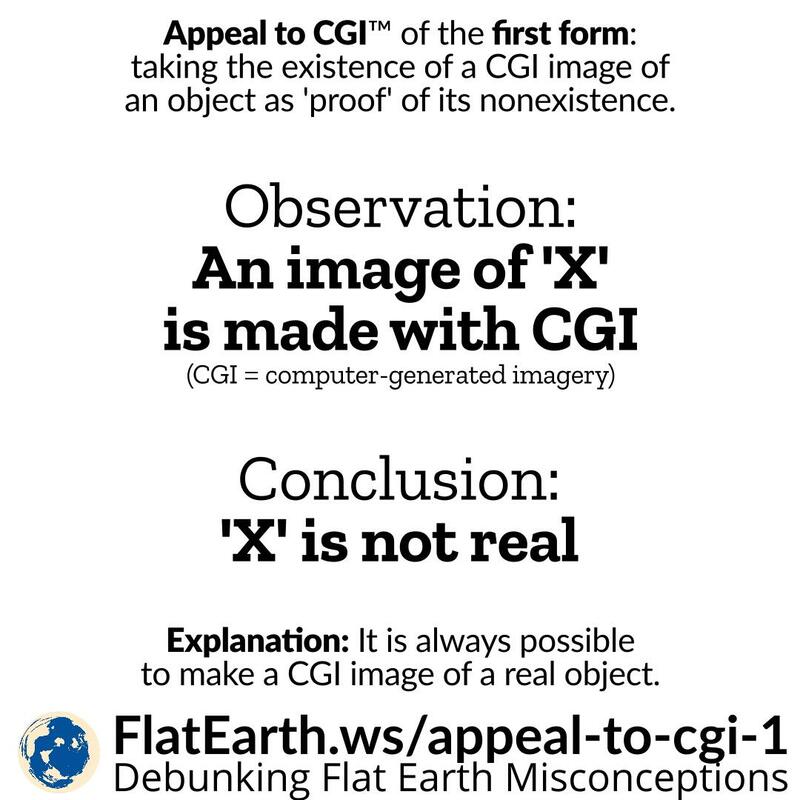 This is a fallacy because it is definitely possible to create a CGI image or video of a real-world object. Gravity is not the result of a particular shape of an object. It is caused by mass. All objects with mass exert gravity to each other. The larger the mass of an object, the greater the force of gravity. On Earth, water forms a spherical surface which has the same center as the Earth. It applies to every surface of fluid which is under influence by Earth’s gravity, unaffected by another force. In a 10 cm wide container, the amount of curvature is only 0.0000002 mm. It is the reason the surface appears flat in small containers. Why Don’t We See Satellites in Photos Taken From The ISS? 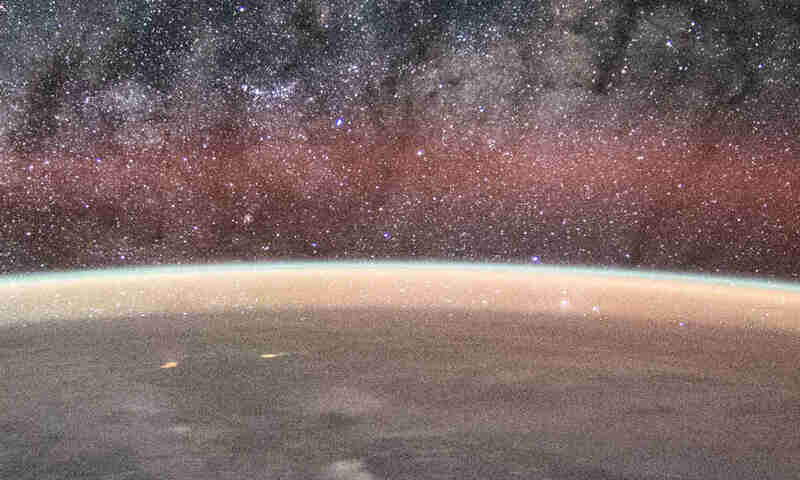 “Why don’t we see satellites in photos taken from the ISS?” (or from space in general). 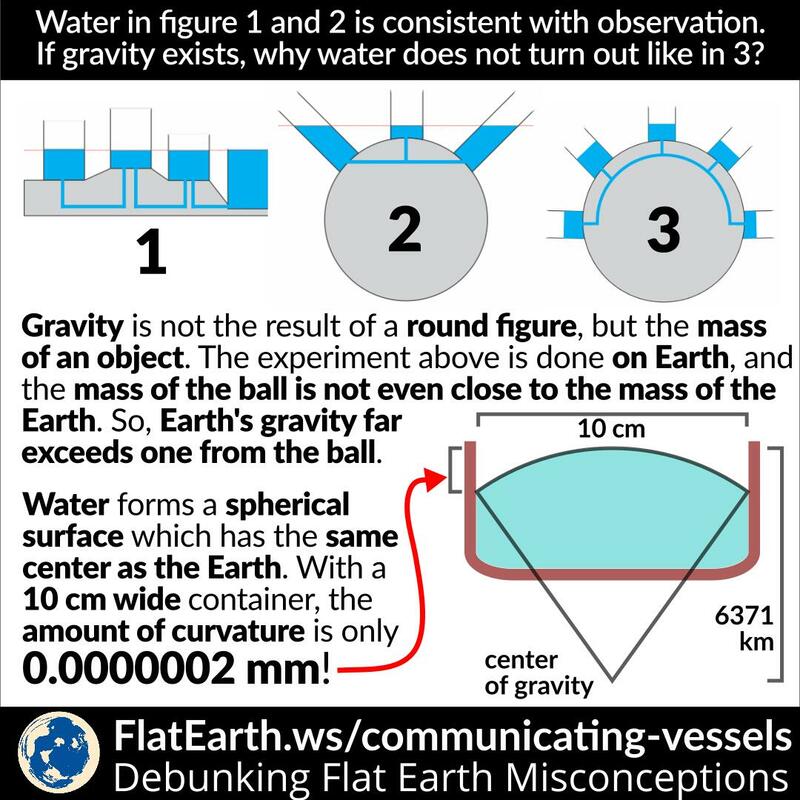 That’s a recurring question within the flat-Earth community, usually asked without expecting an answer, assuming that an answer is impossible, and that it is a glaring oversight when the powers that be purposefully made the picture using CGI. But no, the pictures are real. 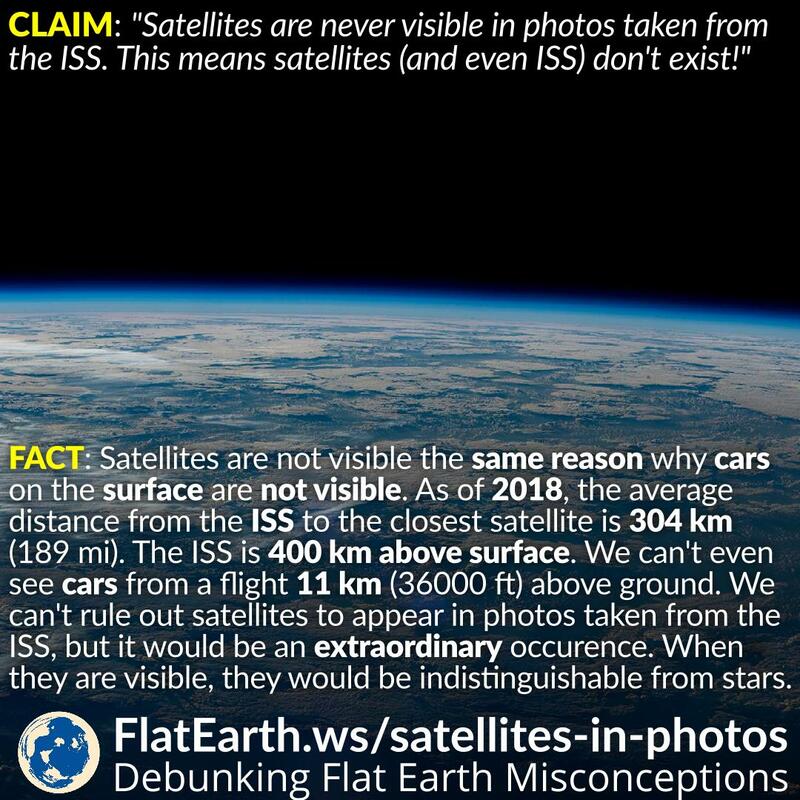 And satellites are not visible because they are too far spaced apart from each other. Many flat-Earthers will tell you that Nikola Tesla is actually a flat-Earther. The supposed ‘evidence’ is a piece of quote that is claimed to be from Tesla himself; but in fact, it is not. It is actually a really terrible misquote, and an attempt to take the quote out of context. The source of this problem is apparently a Facebook post that quotes Tesla, as well as a Facebook user named ‘Darrell Fox’. Accounting for the curvature of the Earth is not usually needed for narrow high-rise building projects. Designers only need to ensure the foundation is flat, and the curvature of the Earth becomes non-factor. 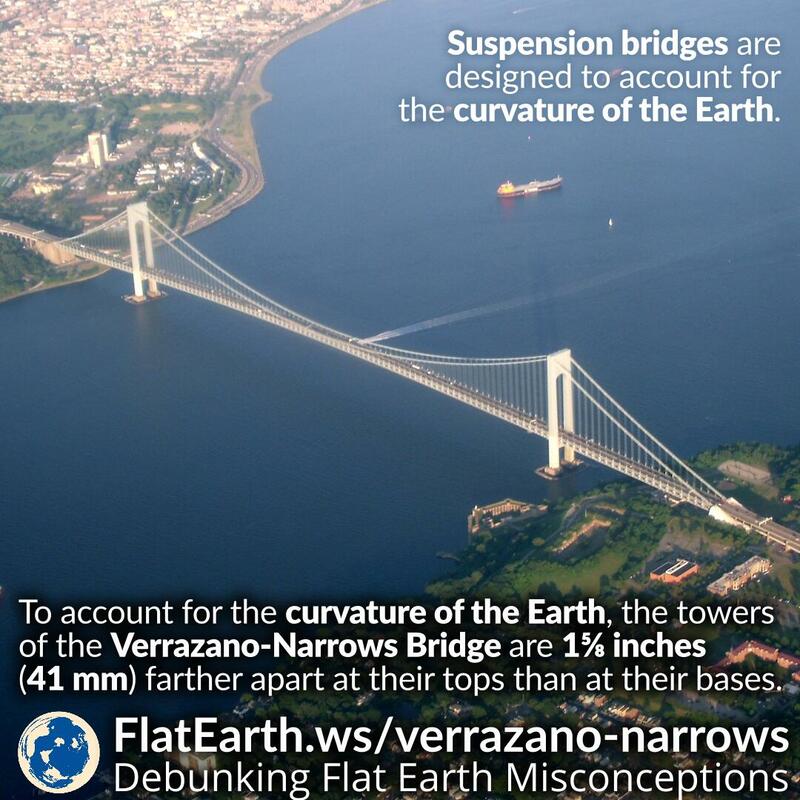 For projects that extend over a long distance, like roads, railroads, canals, etc., they are built along the curvature of the Earth, and specifically accounting for the curvature is usually not needed. But when the project extends on a long distance, as well as extending upwards, then we have no choice but to take the curvature of the Earth into account. One of such projects is the Verrazano-Narrows Bridge, New York, United States. ‘The Principle’ is a pseudoscientific documentary that promotes geocentrism, that the Earth is stationary and the center of the universe. 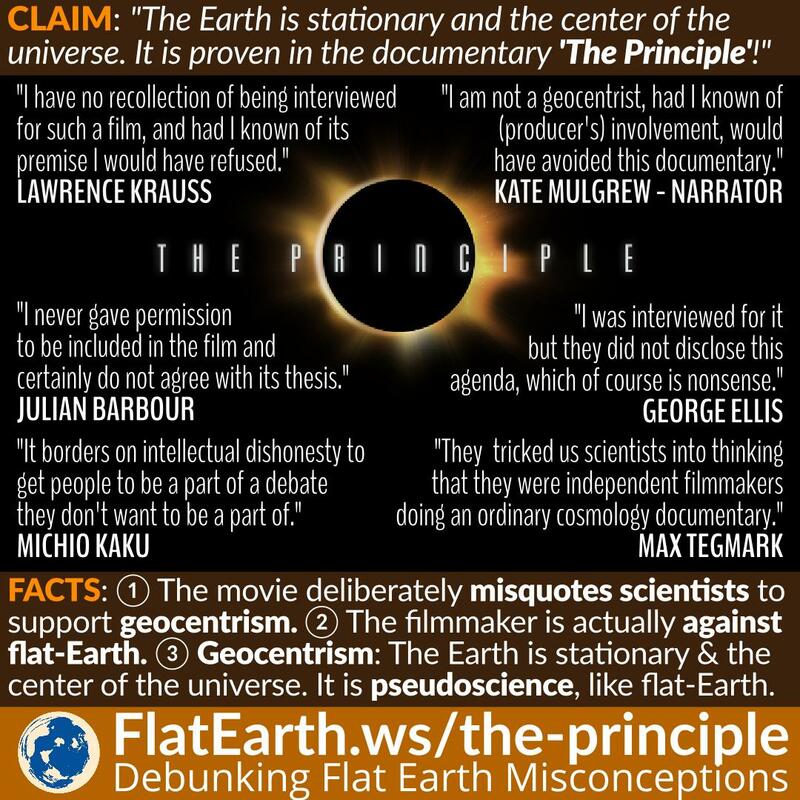 Despite the fact that the film has almost nothing to do with flat-Earth, some flat-Earthers decide to use this film to bolster their beliefs. Because after all, in the flat-Earth model, the Earth is stationary and the center of the universe, right? This actually gets more complicated than that. We are dealing with two forms of pseudoscience, that sometimes even goes against each other.